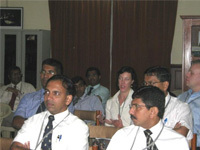 This course was initially developed by the injury and violence prevention Department of the WHO Geneva and the college of Surgeons of Sri Lanka headed by Dr Ranjith Ellawela initiated to hold this course in Sri Lanka for the very first time. 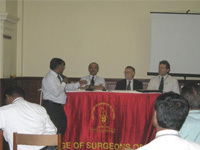 The inauguration ceremony was held at the Auditorium of the College of Surgeons of Sri Lanka on 20th September. The attendees included Country Representative for WHO Dr Firdosi Rustom Mehta and Additional secretary of Medical Services from the Ministry of Health Colombo Dr P.G. 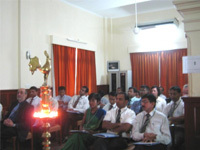 Maheepala, all the overseas faculty members and all participants were present for the inauguration. The course was conducted for 28 Participants and 5 Observers which included Consultant Surgeons, Consultant Anaesthetists & Medical Administrators from the Ministry of Health and some medical officers who were interested in trauma care. The course organiser was Dr Ranjith Ellawela and the Director of the course was Prof. Charles Mock from University of Seattle U.S.A who was formerly attached to WHO HQ. The rest of the resource team included Prof. Russell Gruen - Professor of Surgery & Public Health, The Alfred Hospital & Monash University, Australia, Dr Witaya Chadbunchachai - Director of Trauma & Critical Care Centre & Senior Deputy Director of Khon Kaen Regional Hospital ,Thailand, Dr Manjul Joshipura - Director Academy of Traumatology , India. A Copy of the Book Titled “The Guidelines for Trauma Quality improvement” was given as the course material to each participant.